OSHKOSH, Wis. & PORTLAND, Ore. - July 23, 2018 - PRLog -- Bluemac Analytics announced today at EAA AirVenture Oshkosh the new Blueavion f1 sensor system. The Blueavion f1 by Bluemac provides accurate estimations of aircraft operations at unmonitored or partially monitored airports for use by airport operators and transportation agencies. Aircraft operations are supplemented by available detailed data regarding each operation for use in effective airport management, planning, funding, and community relations. The Blueavion f1 relies solely on aircraft transponder signals (ADS-B and Mode C) and once installed at an airport, runs without further customer intervention. The Blueavion f1 uses the latest technology and security, offered in flexible and customizable device configurations. The device installs at a single location on or near airport property and is combined with a Cloud-based back-end and web-portal for easy access to the data and device status information. No more scraping together pilot logs, implementing manual counts, or maintaining troublesome count methods such as pneumatic tube, acoustic, or video-based to estimate operations. The Blueavion f1 delivers total operation estimates and makes available the underlying data needed to efficiently determine fleet mix, identify high economic value operations, and help optimize the usage for airport-based aircraft. The Made-in-the-USA Blueavion f1 applies Bluemac's roadway system design for robust environmental toughness and proven reliability. By applying a blended approach across ADS-B (including Mode S Extended Squitter) and Mode C transponder data combined with a proven algorithm created by and licensed from Purdue University's Purdue Office of Technology Commercialization, the Blueavion f1 can accurately estimate operations (both General Aviation (GA) and commercial) for an unmonitored or partially monitored airport without additional logging equipment or techniques. Airports should not rely on ADS-B alone for operational counts as even by the 2020 FAA ADS-B mandate, ADS-B will not have 100% penetration in GA. However, by processing Mode C data combined with ADS-B Out using Purdue's algorithm, the Blueavion f1 delivers a high level of accuracy estimating total airport operations. Unlike the various unreliable estimation techniques, earlier versions of the Blueavion f1 field trialed by Purdue University have delivered counts within a few percent of actual operations after 30 days of logging. The Blueavion f1 is completely centered on the airport and not a byproduct of a more general data feed. Alternative crowd-sourced data and reports available for use by airports can cost thousands of dollars per year, yet only cover ADS-B, and are not originally intended for airport operations. Other technologies, such as acoustic and video, are also very expensive and tricky to install and maintain. Pilot logs are unreliable and typically incomplete. The Blueavion f1 is easy to install and after a short self-calibration period (no intervention required) the system delivers accurate operational counts with accompanying detailed data (when available) giving airport operators full insight into who, when, and how their airport is being utilized. The Blueavion f1 provides a cost-efficient means to quantify airport operations. Only one Blueavion f1 is needed for each airport location, and the system self-calibrates upon installation. It can be installed outside of the runway and apron, typically no additional permitting or installation requirements needed – just a 360-degree view of the sky around the airport and line of sight to the corresponding runway or runways being monitored. The economic model is superior compared to human-based counts for specific periods and the Blueavion f1's performance is better than mechanical or visual counting systems - with greater reliability. The system utilizes ADS-B to calibrate the data set and then applies it to Mode C data. The customer just has to turn on the Blueavion f1, good to go! Since it is Cloud-hosted no server hardware is required, further simplifying the IT requirements, and the data is easily yet securely accessible via a web-based portal. The Blueavion f1 provides device management support with device status integrated into the customer portal. Combined with over-the-air updates and device provisioning, plus remote software diagnostics and status, the Blueavion f1 is assured to deliver the needed up-time to consistently and constantly log operations. All Blueavion f1 devices are built under ISO:9001 quality standards using industrial grade components and housed in proven NEMA TS2, IP68 enclosures providing strong environmental protection. Blueavion f1's use Bluemac's design techniques proven by thousands of deployments spanning almost a decade for use as roadside sensor units on behalf of leading transportation agencies worldwide. Bluemac offers flexible purchasing options as one size does not fit all. And of course, the Blueavion f1's efficient installation and maintenance experience is much improved compared to acoustic, pneumatic, or video camera-based systems. Custom designed, best-in-class ADS-B / Mode C receiver. 1 GHz ARM processor with 2000 MIPS of processing power. 512MB of DDR3L 800 MHz RAM. Quad band 4G LTE NB-IoT / Cat-M1 Modem supported by all the major carriers. Low power draw, energy efficient. Utilizes Amazon's industry leading, secure AWS-based cloud system. State-of-the-art security for device access utilizing rotating key access scheme in concert with the Cloud system and onsite access. Secure encrypted communication from device to the Cloud. All logged data is stored in encrypted form in the Cloud. Configurable for cross-customer data sharing in a secure, controlled manner. The Blueavion f1 is offered in multiple configurations that can be customized to fit the needs for each customer's unique deployment needs and locations. The Blueavion f1s is a solar-powered self-contained cellular networked unit that can be installed anywhere, including outside airport grounds or in remote airport locations without the availability of power or a hardwired Internet connection. The Blueavion f1e is intended for external-mounted installations and is appropriate for outside installations with available power. Ethernet is standard, but this unit can optionally support cellular data delivery. The Blueavion f1i can be mounted in an environmentally protected location, assuming the device can be properly situated for appropriate ADS-B and Mode-C signal reception specific for the airport. Multiple communication options are available to deliver the data from each Blueavion f1 and to control the device: Cellular 4G LTE, Ethernet, with a planned addition of Wi-Fi for communications. Multiple power sources are available: Mains power, battery, or Power-over-Ethernet for a single cable run to a Blueavion f1 device. Extended run battery packs and larger power output solar panels are available for installation locations that either need additional back-up run time or receive less sunlight during seasonal periods. The Blueavion f1 is sold with first year warranty, one-year access to the Cloud service, and for models using Cellular data the first year of Cellular service is also included – the system is ready to go. Bluemac is here to help with the initial setup and installation. 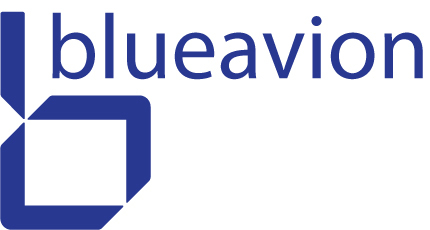 The Blueavion f1, currently in field trial, is only available directly from Bluemac Analytics. Please contact our sales team today to find out more. "The Blueavion f1 system by Bluemac brings accurate quantification of airport operations into the digital age. The vast majority of public-use airports struggle to efficiently capture aircraft operations, information which is critical for the complex and varied aspects of effective airport operations. Our exclusive licensing arrangement with the Purdue Office of Technology Commercialization has enabled us to bring their innovative, proven approach to market for the benefit of airport operators and transportation agencies across the United States. And our pedigree in roadway ITS solutions is strongly applied to the aviation market – we are about delivering RF technology with a modern Cloud implementation and algorithms to the benefit of the transportation industry. We look forward to helping many new customers in the aviation sector with our compelling set of tools offered in the Bluemac f1." Bluemac Analytics provides economical and secure systems for ITS roadway applications for leading transportation agencies worldwide. As an early pioneer in applying Bluetooth® probe technology starting in 2008 for transportation agency solutions and an ISO 9001 certified firm with deployments across the world, our devices and services are proven and robust. Bluemac is taking that expertise into the aviation market with the Blueavion f1. Bluemac's devices and services are proven and robust. Bluemac is a key component of ITS solutions at the state, county, and city level. Bluemac systems are Made-in-the-U.S.A.